CAPE CANAVERAL, Fla. (Dec. 2, 2014) — KENNEDY SPACE CENTER – There’s no better place to be on the morning of Thursday, Dec. 4 than Kennedy Space Center Visitor Complex, where guests can witness firsthand Exploration Flight Test-1, or EFT-1, the test flight of the uncrewed Orion spacecraft from America’s gateway to space and experience a complete pre-launch-to-post-splashdown program, including Orion-related activities, exhibits, astronaut appearances and live coverage and commentary. 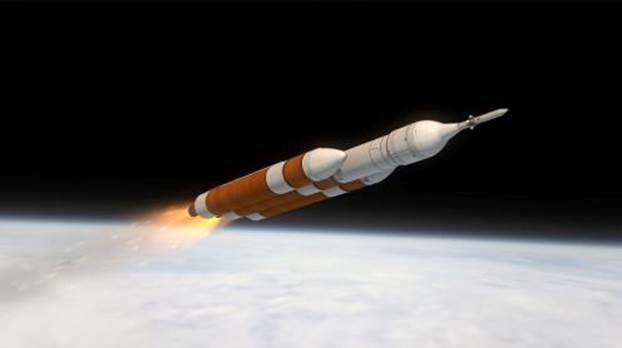 EFT-1 featuring the Orion capsule aboard a United Launch Alliance Delta IV Heavy rocket, is set to lift off from Space Launch Complex 37 at Cape Canaveral Air Force Station as early as 7:05 a.m. The two-orbit, 4.5 hour mission culminates with a splashdown of the capsule in the Pacific Ocean. Join John Zarrella, former CNN space expert and correspondent, for the Journey with Orion program leading up to launch, beginning at 5:30 a.m. and the Countdown to Splashdown program, beginning one hour prior to splashdown. Mission experts and astronauts join Zarrella on stage to share their unique perspective during the mission. Guests will be invited to ask questions and participate in giveaways. A CNN veteran for 32 years, Zarrella has covered more than 75 shuttle missions including the launch of the Hubble Space Telescope and repair missions, John Glenn’s return to flight, the loss of Challenger and Columbia and the return to shuttle flight, as well as the final shuttle mission, STS-135. Live NASA TV coverage of the mission, beginning at 4:30 a.m., will be broadcast throughout the Visitor Complex on Jumbotron screens in the Rocket Garden and outside of Space Shuttle AtlantisSM, on giant IMAX® Theater screens and in the Astronaut Encounter Theater. Live coverage will also be displayed at the Apollo/Saturn V Center throughout the launch countdown and launch. Astronaut appearances are scheduled at various locations during the launch countdown including NASA veteran space shuttle astronauts Sam Durrance, Bruce McCandless, Mike McCulley, Jerry Ross and Winston Scott. Guests may meet renowned photographer Michael Soluri on Dec. 3 for a book signing and presentation for his new book, “Infinite Worlds: The People and Places of Space Exploration.” A 30-minute presentation by Soluri will be held at 12 p.m. in Exploration Space®: Explorers Wanted. Soluri will be available to sign copies of his book at 1 p.m. at The Space Shop. Visit Space Shuttle AtlantisSM to view 27 of Soluri’s images of the NASA and Kennedy Space Center workforce. Soluri has documented humankind’s space exploration journey for more than 15 years. His new book takes a behind-the-scenes look at NASA’s centers in Florida, Texas and Maryland. Published by Simon & Schuster, “Infinite Worlds: The People and Places of Space Exploration” features more than 300 fascinating images, 15 essays and a forward by legendary former astronaut and Senator John Glenn. NASA and Orion experts are scheduled to speak Dec. 3 and Dec. 4 on a variety of topics including NASA’s new Orion spacecraft and the Space Launch System. The launch window is set for the morning of Dec. 4, beginning at 7:05 a.m. and extending to 9:44 a.m. Guests may choose from two viewing sites: the Apollo/Saturn V Center located within secured areas of Kennedy Space Center or the Space Shuttle AtlantisSM attraction, situated at the main Visitor Complex. The Apollo/Saturn V viewing area overlooks the scenic Banana Creek and offers a lawn area and bleacher seating with a view of Launch Pad 37, just 8 miles away at Cape Canaveral Air Force Station. This location is accessible only by bus from the Visitor Complex. A limited number of tickets are available for launch viewing from the Apollo/Saturn V Center for $20 plus the cost of admission. Bus transportation to the Apollo/Saturn V Center is available from 3 to 6 a.m. Viewing from Space Shuttle Atlantis is included in admission. Admission and launch viewing tickets can be purchased online at www.kennedyspacecenter.com. (Visit the website for additional information, including the launch scrub policy). After launch, guests can spend the day exploring Space Shuttle AtlantisSM, Exploration Space: Explorers Wanted, Rocket Garden and other attractions. At dusk, the Visitor Complex presents its all-new Holiday Rocket Garden Light Show in the majestic Rocket Garden featuring a choreographed light and music program. Guests also will be treated to a stunning array of decorations including a 41-foot Christmas tree and a giant NASA “meatball” ornament. Kennedy Space Center Visitor Complex brings to life the epic story of the U.S. space program, offering a full day or more of fun and educational activities, including the Kennedy Space Center Tour featuring the Apollo/Saturn V Center with an actual Saturn V moon rocket, Shuttle Launch Experience®, 3D IMAX® space films, Astronaut Encounter, Exploration Space®: Explorers Wanted and many other interactive exhibits. The new $100 million home for Space Shuttle AtlantisSM opened June 29, 2013. Admission also includes the U.S. Astronaut Hall of Fame®, featuring historic spacecraft and the world’s largest collection of personal astronaut memorabilia, which opens daily at noon and closing times vary by season. Only 45 minutes from Orlando, Fla., Kennedy Space Center Visitor Complex opens daily at 9 a.m. with closing times varying by season. Admission is $50 + tax for adults and $40 + tax for children ages 3-11. The Kennedy Space Center Visitor Complex offers annual passes starting at $75 + tax for adults and $60 + tax for children ages 3-11. For more information, call 877-313-2610 or visit www.KennedySpaceCenter.com. This entry was posted on December 2, 2014 at 9:31 pm and is filed under attractions, family travel, space travel, special events travel. You can follow any responses to this entry through the RSS 2.0 feed. You can leave a response, or trackback from your own site.